In high school I was in college prep courses and despite standardized tests reminding me I sucked at math I managed to graduate in 2006 at the age of 17 and took the assessment to become a Cerritos college student. The week after graduating I immediately started attending Cerritos College in the summer bridge program of EOPS. It was a great program and I enjoyed that we had our own counselors which meant it was faster to have an appointment. I was not surprised I scored the lowest math level in the entrance exam. If a class required dealing with numbers and symbols, I was pretty much out of there. I had no clue what anxiety was, but I remember when I would be in a math class, I would often feel like someone turned up the temperature in the room and things were spinning. If that wasn’t bad enough, I would feel as if I couldn’t take full breaths in a math class. I tried to see a tutor but believe me I still felt that sick nauseous feeling when I would look at math problems. I would get upset and wonder why is it that college makes us take math when we aren’t interested in a career field that deals with that kind of critical thinking. I can write a decent argumentative essay and I can pass a speech class no problem just don’t ask me to do math. I remember trying to search for loopholes to get out of math , for example I heard that you can go to a counselor and if the last math course in high school with a letter grade of C or higher you could get a counselor to clear you up to that level. I looked at it as if I wouldn’t need math but even with that clear you needed a higher math to get your degree and transfer to a university. One day my anxiety was so bad in class that the professor placed us in groups, and I knew one by one the group had to go to the board and talk about their math problems. I took a “restroom break” and stayed in the restroom wetting my face in the sink because I was having that fever spinning feeling again. Unfortunately, I lost track of time and when I returned to the class the professor changed my attendance from present to absent. I was so infuriated but couldn’t do anything because I had documentation at the time no medical reason to explain what I was experiencing. After many failed attempts I just stopped taking math because I realized I was just crippling my grade point average. The policy on campus at the time was if you fail a class twice you need to write your reasoning for why you deserve to take a class a third time. I remember filling that petition form several times and that’s just how terrible I was that I felt it wasn’t even worth trying to take math anymore. This affected my social life as well. What made me more miserable was when I would see friends and family at gatherings, and it would never fail eventually I would become the subject of discussion and get asked “How come you are still in school? So, and so just finished or so and so just got their degree and is moving on to the masters etc. why can’t you?”. That was the last straw for me and I became reserved and stopped socializing and going out. I simply went out for important things but not for socializing other than that I just stayed home to avoid becoming the subject of discussion because it was better for my health to avoid getting a headache. I just felt a sense of humiliation and would cry some nights until I would go to sleep. I drifted through various disciplines taking a variety of courses Cerritos College had to offer trying to figure out a way to keep my mind occupied. I even served the state for a year in AmeriCorps where I received a certificate of congressional recognition and the presidential volunteerism pin. I tutored elementary students after school, but you guessed it I was no help with math homework questions; I left that to the other tutors because chances are the elementary kids could solve more math problems than me. Someone recommended that since I am still going to be in school for a while i might as well invest my time in completing 12 units in child development because it helps you land jobs in the future which benefited me later for picking a minor that i can finish on time. Eventually I was no longer able to be a part of EOPS because I reached the max number of units plus financial aid eventually cut me off as well because I had been in community college for too long. I was miserable and now had to also come up with ways to buy school supplies so I would get involved in order to win scholarships. In the summer of 2011, I decided for at least one semester I would go to a new campus where no one knows me and do something I have never done. I went to Long Beach City College where I took an acting course taught by Hal Landon Jr. For the first time acting was a way for me to forget my troubles and just get into character. While although I didn’t care much for the exercises because some of the activities involved memorizing students’ names which I was never good at; when the time came to get handed a script and be assigned a role I performed well. I learned that my creative side was more active than my problem-solving ability. I love acting but haven’t had time to pursue it and do more of it; hopefully one day I can have the opportunity to become an actor. In the fall of 2011 I returned to Cerritos College and took a radio television course with professor Craig Breit, an alum of CSULB. He inspired me with his story he would share about how Mando Fresko of Power 106 Radio was his student and how he used to spend hours in the radio station until late at night to the point he had to remind Mando that he wanted to lock up and go home already. Mando dedicated lots of his time to our campus radio station and would go on to become the youngest on air talent of Power 106 Radio . Professor Breit’s teaching style was great it always felt like I was watching a stand-up comedian. He was a great mentor and always encouraged me to be involved. At that time in order to become a host of your own radio show you had to take the radio production course, pass the scantron midterm exam and pass the hands on in studio exam. After being a guest on a few shows I decided I would take the exam early and became an official host on Halloween 2011. Students like Simon De La Cruz stood out to me because he had a radio show where he dedicated so much time outside of the studio creating a robotic voice that complimented his show theme. The theme of his show was he was the captain of a spaceship that took you to different parts of the world and educated you on cultures and played their music as well. He used a text to voice feature scripting segments where he would communicate with his spaceship’s robot sort of how Iron Man talks to Jarvis. That semester I was still figuring out what my show theme would be as most shows seemed to have its own signature. I started from the bottom as we all had a job in the studio, I used to be the music librarian and would file CD’s that would get mailed to our studio from up and coming artists and I would place them in our music library room in the lobby. In 2012 I was still in the process of completing the radio television program but then the degree got cut and I heard about an associate’s degree called media studies. The degree counted the RTV courses I passed and film and tv production courses. All I needed was to start taking journalism courses to complete the degree and that is what I did. I took a multimedia journalism course with professor Richard Cameron. That summer Professor Cameron said he wanted us all to run our own blog and tailor it to whatever career we were interested in. Being that he was aware I was already involved in radio; he encouraged me to make my blog different and instead of doing mine on radio he said I may be interested in the history of our campus organizations. So I spent time in the student activities office and what stood out to me were these plaques and one in particular huge plaque that had small name plates with club names and the year each was established some dated back from the late 1950’s to the mid 90’s . After having a good chuckle from reading the name drinking fountain club it really made me realize how any student can create a club but it was more cool to see how in the past clubs were kind of immortalized by having its name added to the plaque. That summer course was fun, and I learned that many years ago Cerritos College even had fraternities but were banned at a certain point. I remember taking a health class and the professor offered extra credit if we experienced what it was like to see a therapist and how its not bad to talk to one . I almost wanted to laugh because when I had a chat with the therapist I mentioned how enjoyed acting and she said “do you hear yourself? You are more comfortable when you are portraying other characters. I want you to feel comfortable being you.” I just thought to myself okay I am just here for the extra credit and then I am out of here. I figured all I ever need is the radio station because every time I was in a studio I felt at peace and forgot all my problems while I was live on air. I would rather be happy and utilize my creative abilities than be unhappy trying to make a buck. I felt heavily judged but at the time I had no medical diagnosis to explain what I struggle with. To some I may sound picky but to me I looked at it like “Hey my youth is passing me by and I am becoming more seasoned over time growing my knowledge with every class I take”. It wasn’t easy for me to open up and say oh hey I stopped seeing family and friends because I was tired of pessimistic comments or feeling judged or one comment I got was why not just work at a McDonalds. There is value in volunteering building your resume so don’t let anyone discourage you from pursuing your dreams. This multimedia class motivated me to network with clubs as I was doing research on how students can get involved in college which lead to me serving a term in the student senate. I also served an appointment as the assistant commissioner of public relations reviewing publicity requests from organizations that wanted to post their flyer or poster on designated buildings. I even wrote for the campus newspaper Talon Marks. I learned about campus wide shared governance committees and served as the student representative in three; developmental education, student learning outcomes and enrollment management. My name attached to agenda’s forever cementing my legacy. Serving alongside faculty, staff, deans, department chairs, vice presidents etc. 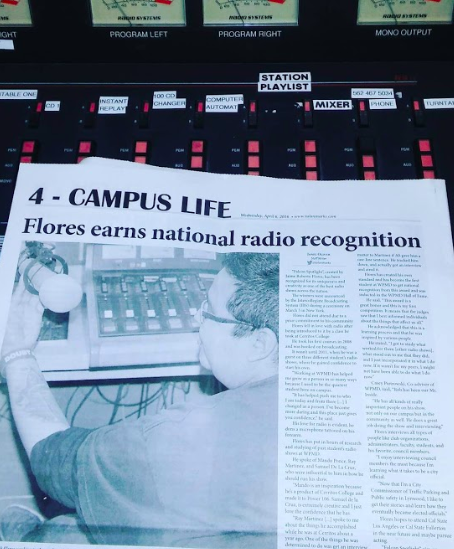 by this point my radio show evolved from interviewing clubs of the campus, professors, faculty, administrator and other people from campus to outreaching to community figures and others from different career fields. I was fortunate to have interviewed all kinds of guests including actors, comedians, law enforcement, fire department and even politicians including the Norwalk Mayor. In 2015 I was getting off the metro walking home when a car pulled up and I heard laughter and someone calling me then a gun was aimed at me. However, the car decided to leave into the freeway as I continued to walk home, I decided to attend city council and ask how I can get involved in my city. That’s how I learned about neighborhood block watch and became Captain of my street and I attend a monthly meeting where all the captains of the city meet with the local deputy sheriffs to keep informed about crime in the city. In 2016 I achieved my greatest accomplishment when the Intercollegiate Broadcasting System named my show the best public affairs program in the nation. This made front page news on the Norwalk Patriot and a press release from the Cerritos College website. I did everything I could to stand out during my college radio career including investing in my own camcorders and tripods to have my talk show available on Youtube since I did all talk I was able to own all my content and not worry about copyright. Eventually I started archiving my videos on my Wordpress www.robfloresmedia.com . I even co-hosted a talk show with my friend Ethan Ortiz where we discuss the latest pro wrestling news and critique televised matches from various wrestling promotions. To set the show apart from others we got championship belts with custom air brush on the back and call ourselves the World Broadcasting Tag Team Champions of the World. I even competed in JACC for news writing and won an honorable mention award at the So-Cal conference. In 2016 my city council appointed me to serve a year term as a commissioner in the Traffic/ Parking and Public Safety Commission where I listened to residents concerns and voted on things such as adding stop signs and reviewing requests from disabled individuals asking for their curb to be painted as a handicap spot. I think it's great to get involved and make a difference . It is an honor to become a commissioner because usually I noticed only older people are appointed like senior citizens , business owners etc and here I was one of the younger commissioners learning from these seasoned community leaders. My dad got hurt on the job driving a company truck he told one supervisor but that person never told people above him. Now the job denies and won’t take responsibility. He kept working while injured and fell several times. It was originally just a bad toe but because of falling now even his spine discs aren't the same.he was just a maintenance worker doing things like cut grass, trim bushes, etc. but they were having him climb stairs holding cement bags to a construction site doing things outside his job descriptions. The job was shady in the end sending letters acting like they were concerned wanted responses by a certain date but it would get mailed weeks after said deadlines. I have gone with my dad to several doctor appointments , watched him get injections on his foot, watched him get acupuncture. His lawyer has had no luck getting the job to fund surgical repairs. It just further fueled me to earn my degrees. Our family has depended on my dad’s income and we have struggled for a while now. It is depressing to see my dad struggle to walk and depend on a cane. A political science professor named Terrance Mullins shared his personal story in class about how when he was in college a professor told his class that students should consider getting tested for learning disabilities and that is how he learned he had a learning disability. I researched and was disappointed to hear you must pay out of pocket in order to get that expensive test done. As I was saving, I had to get through my remaining general ed courses because I held off on them. I knew I hated dealing with numbers and symbols and too much reading made me sleepy. When I took my critical thinking English class for argumentative writing I had to be resourceful since I still had no way of knowing I had a learning disability. Our class had to read the novel 1984; I was fortunate to have found a YouTube audio book so I would play the video every night and that is how I participated in class and in order to write my essay I also researched documentary videos especially from the history channel to create an argumentative essay about surveillance. Eventually in 2017 I was able to get tested for learning disabilities and joined the disabled student services program where I now had a notetaker for my classes and testing accommodations etc. What frustrates me is that colleges may not have the funding to evaluate you and determine if you have learning disabilities. I had to work hard and save up about $1,500 out of pocket and find a facility on my own to go get tested. I feel like it makes it difficult for other students who may not have the money to get evaluated and will be stuck in a dead end unable to move forward with their academic goals. I was able to use my diagnosis to submit a petition to have my transcripts reviewed and prove that I have met the requirements for the AA and just need courses substituted due to my disabilities and thus I was able to get my Associate degrees and transfer here at CSULB through the BMAC program. While yes I was depressed that i was in community college for so long ; Cerritos College will always hold a special place in my life because i grew as an individual and found out what were my interests. You have more time to get involved in community college in my opinion than at a university because the workload at a university can be more demanding on top of the fact that you have to get internships once you are an upperclassman. What gravitated me towards broadcasting was that you can just press record and interview someone and you can refer to a recording and wing it during interviews. I don’t find acting or being a talk show host difficult because it just comes natural to me and I get to express my creativity. I am now 30 years old and I now look at my time in community college as beneficial it doesn’t matter how long it took me i grew as an individual because of Cerritos College and the various professors that helped me along the way. It is so cool to know professors do amazing things even outside of campus. I will finally achieve my bachelor’s degree in journalism with a minor in child development and family studies this May .